You Gonna Lose That Good Thing, Baby– Oh, YEAH! Please notice that’s she’s playing, not a Telecaster, but a Fender Esquire– no neck pickup– lefthanded. Many folks don’t realize that Leo Fender’s original design for what became the Tele was what was later called the Esquire, as it was a bridge-pickup-only guitar. If you think that band behind Ms Lynn is totally locked in a perfect groove, you’re correct! And what a band that is. On piano is Mr. Johnnie Johnson who played behind Chuck Berry on all his sides, and many believe he actually at least co-wrote many of the songs Berry took credit for. He was just a stunning piano player. He was inducted into the Rock ‘n’ Roll Hall of Fame in 2001 after Keith Richards waged a campaign for years for his inclusion. On bass is Mr. Billy Cox, who was Jimi Hendrix’s first and last bass player. He’s played with everybody at one time or another and is still going strong. He was in both the Jimi Hendrix Experience and Band of Gypsies. He met Jimi when they were in the Army together and encouraged his guitar playing. That bass he’s playing appears to be a Fender Precision fitted with a Jazz Bass neck. On the maple-glo Rickenbacker guitar is none other than Mr. Clarence “Gatemouth” Brown, who was a guitar legend. Originally a drummer, he got his first break as a very young man filling in for an ailing T-Bone Walker on guitar and never looked back. He’s in the Blues Hall of Fame and may be better known in Europe than he is here in the States. Guitar-slingers study Gatemouth Brown and take careful notes. As for Ms. Lynn, she’s living in Beaumont, Texas, and still plays out regularly. I refuse to give her precise age, but she’s two days shy of being ten years older than yours truly. Notice her left hand; she’s using a thumb pick and her strumming is almost all upswings. Also, that Esquire has a rosewood fretboard and she kept the bridge cover on it. Cool guitar– and a pink strap! Oh, YEAH!!! 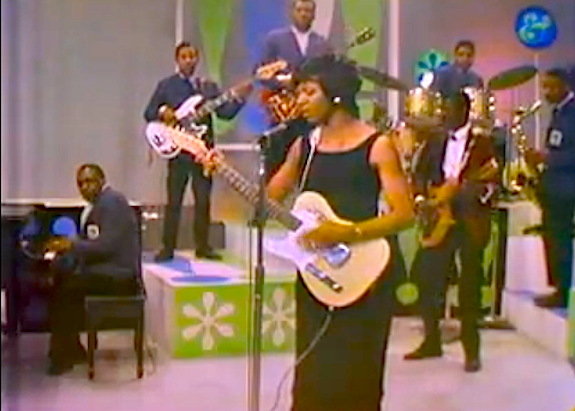 Ms Lynn plays a white Strat nowadays but I hope she still has that Esquire in a closet somewhere.